First bottle from the Book was Stolichno Bok that one of the attendees brought from his ski holiday in Bulgaria. It was clear and reddish and had velvety wine aroma. It tastes sweet, a little like cherry and has a heavy body with light carbonation and long finish. Dreher Bak was our contribution to the mission. We got bottles from our Hungarian friend Izabella, whom we first met 5 years ago via Couchsurfing. She stayed with us a couple of times and came again last month, with two bottles of Dreher Bak, per our request. This is a dark brown beer that has a sweet malty aroma, with hints of cooked fruit. It tastes bitter and dry and roasty and has a smooth texture, full body and long finish. Not bad at all! We have another bottle – good for us. I think we tasted something from Urthel brewery on our trip to Belgium, but I don’t think it was Hop-It. Born in Belgium, Urthel is now brewed in Koningshoeven in The Netherlands. It’s a Belgian (or Dutch?) IPA, a little hazy in colour, with rich honey aroma that’s probably shouldn’t be there and a weird taste that begins sweet, then becomes bitter and feels soapy all along. Its finish is like a bitter apple and the carbonation is lively. I think that the bottle is either old or off. Dunno. American or Belgian? Ommegang Abbey Ale poured hazy dark amber with a unique big yellowish foam head. It’s as heavy, fruity and honey-ish as one would expect and tastes really sweet and slightly bitter. It was a little metallic, too. The body is full, the finish is long, carbonation is medium. Last night wasn’t our first encounter with Stone, not even in the 1001 Beers Challenge. Stone Ruination IPA is great, clear and blond and smells of peachs and grapefruit. It’s bitter, of course, straight to the point, but milder than I thought it would be. It was crisp, light-bodied and well carbonated. Not sure whether or not I ordered Rogue Dead Guy Ale, as I’ve been eyeing this beer for quite a while. If we get it now I’ll be a little disappointed, for “wasting” my mail order on beer I have already sampled… It was alright, but not that amazing: a little apple and sweet aroma, a slightly bitter taste, apricot both in the nose and the mouth and not really carbonated. 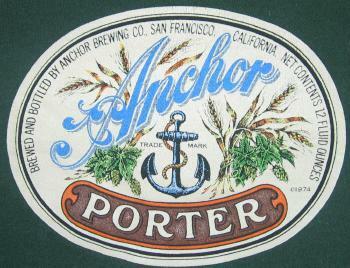 Anchor Porter, however, was more to my liking. It was dark and opaque and smelled of chocolate and charob and tasted smooth and sweeet like chocolate milk. Medium bodied, slight carbonation and medium finish. There were other beers there, and at least one beer that’s worth a post of its own. Soon. Now I gotta check out and make some big decisions about Purim celebrations: should we stay in or should we go to the grand opening of Dancing Camel Brew Pub new location? Went to bed after 2 a.m after last night’s tasting and barely made it through work today. I think we’ll end up staying in, drinking coke and coffee. 15, 16, 17, 18, 19, 20, 21 beers I must try before I die.